Plant a tree in memory of Francis D.
Be the first to share your favorite memory, photo or story of Francis D.. This memorial page is dedicated for family, friends and future generations to celebrate the life of their loved one. 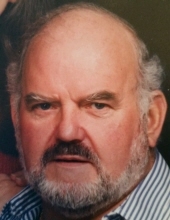 Francis D. "Butch" Mellin, 81, of Beallsville, Ohio, departed this life on November 26, 2018 while a patient in Ohio Valley Medical Center, Wheeling, West Virginia. He was born Tuesday, October 12, 1937 in Ravenna, Ohio, a son of the late Willard Mellin and Leora Roth Sedivy. Butch was a United States Army Veteran of the Korean War and a retired construction carpenter. He was a member of Carpenters Local 356; a member of American Legion Post 331 in Ravenna; also a lifetime member of the Ravenna Rod and Gun Club. Butch was a man of many talents and interests. He will be remembered for his love of building things and his love of hunting and fishing, but most importantly he will be remembered for how much he treasured spending time with family and friends. He leaves behind his wife, Brenda Krantz Mellin; a son, Tim Mellin of Rootstown; a step-daughter, Joanne Schoolcraft of Fleming; a sister, Carol Mast of Ravenna; a sister-in-law, Vickie Spriggel of Rootstown; three brothers-in-law, Roy Sayre of Nelson, William Krantz of Spencer, West Virginia, Frank Krantz of Ravenna; four grandchildren; two great-grandchildren; many nieces, nephews, and friends. In addition to his parents, Butch was preceded in death by a son, Todd Mellin and two sisters, Evelyn Sayre and Bonnie Little. In keeping with Butch's wishes, there will be no visitation or funeral service. Friends and family are invited to a "Celebration of Life" which will take place on December 22 from 2pm to 6pm at American Legion Post 331,109 Elm St., Ravenna, 44266. In keeping with his giving spirit, rather than sending flowers or keepsakes, Butch's family requests that donations be made to a charity of the donor's choice. To plant a tree in memory of Francis D. "Butch" Mellin, please visit our Tribute Store. "Email Address" would like to share the life celebration of Francis D. "Butch" Mellin. Click on the "link" to go to share a favorite memory or leave a condolence message for the family.